TechnicBRICKs: TBs TechTOC 12 - Crow, yet again! Crowkillers has been developing his new car for the last 5 months. It is in 1:10 scale as usual and it offers a breakthrough look, while keeping the "LEGO Technic Code". AWD chassis with a front mounted V-10 Engine. 4-speed transmission with gear ratios of: 5/1 (1st), 3/1 (2nd), 5/3 (3rd) and 1/1 (4th). No reverse. HoG steering with working in car steering. Full independent suspension for each wheel. Opening doors that are operated from the rear deck lid (worm gears are used). Rear spoiler that can be raised and lowered with a rolling switch between the seats (worm gear is used). Amazing curves and angles, as seen from every viewpoint you might want to look at it. This guy doesn't stop to surprise us! This is really nice! I like the "Coke bottle" shape of the body. 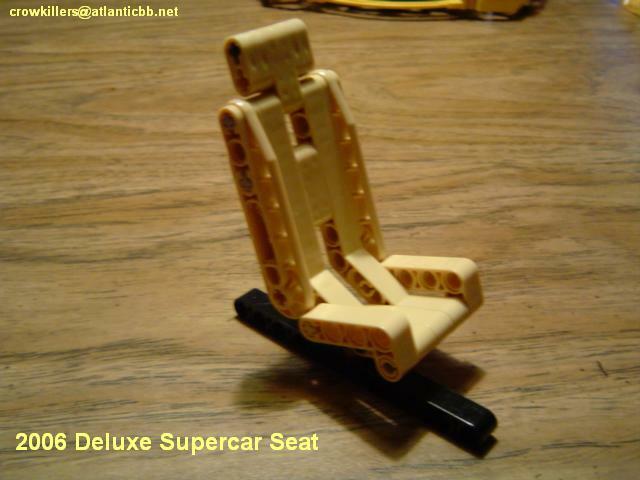 Paul can make a lot of these using the parts from the 10 ea. 8070 sets that he got! Maybe he will show this at the upcoming BrickFair. I'll be the first to admit that I am no fan of technic models with technic built bodies(especially cars) but this here is pretty darn nice! Kudos to the builder. Even though this lacks the multiple motorized functions in one of Sheepo's car models, what it lacks in functions, it more than makes up in overall design. I would very much love to have this model to display with my collection. Instructions are needed. Absolutely love the look of the car. This would be one set I would love to buy and build. Again a great car by Crowkillers. What I love most about this model is that it has a good amount of functions but NO PF. And of course, as said before, the awesome bottle-shape of the car itself! 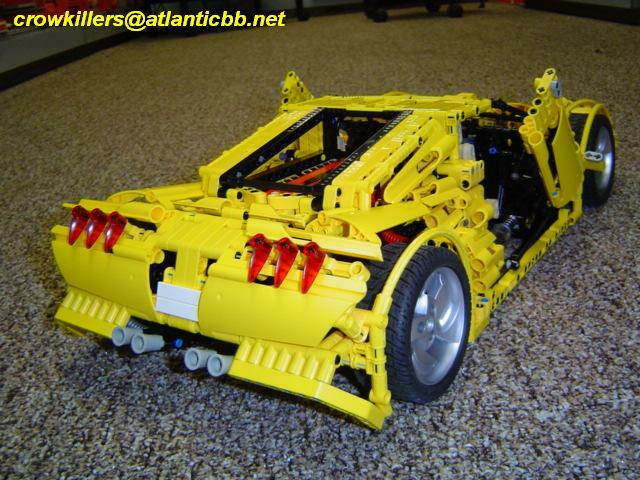 Many times you see technic cars with too much filler and randomly placed parts. This model has much time and thought behind it and looks great. The top view is wonderful to see how he make the rounded the edges are. Very original professional look from all perspectives. impressive. I can agree with you about the power functions. I don't care for them much either. batteries and motors add too much unneeded weight. This model in question is excellent. nice touches all around. even though I don't build cars, I always enjoy looking at Paul's models to see what he comes up with next. Gorgeous, Awesome, Brilliant, Magnificent??? What??? I fail to see what the big deal here is. This is nothing more than a 8070 clone which everyone owns. Sheepo already built the best Supercars with his Porsche and his Bugatti. His cars have tons of more functions and motors are the best for showing off technic. Just look at his transmissions compared to this. It is like master to novice. I see no brakes, no 7 speed transmission, no remote functions, no auto steering, no convertible top. Sorry for my rant, but I don't know why everyone goes crazy for models that are inferior to great ones and copies of existing models at that. IMO you're comparing two absolute different models, that have nothing in common, apart from being both built with LEGO Technic parts. Scale is different. One intends for motorized functions, the other not at all (here again the scale is an important factor). Sheepo's model is also brilliant and well done on its own way. Nothing against that! Paul's model on the other way is much closer to the official Technic cars, in size, style, functions and probably also the construction. Presents an exceptional use of the new panels conferring a great look to the car. The transmission solution seems also an important achievement, from its description. I'd say it is much closer to what an official car could be. After all, two exceptional cars, each in its field. Just my point of view. Sorry! Sorry, what exactly is the "LEGO Technic Code"? I know that phrase refers to the way in which official sets are constructed, but how can Crowkillers say his car "keeps to the LEGO Technic code" when he doesn't even work for TLG? I will only believe this claim if the car has less than 1500 parts. This is not even a tight limit - 8070 had less than 1300. I think the Lego code that he is referring too is staying within the Lego Laws. Not forcing or bending parts as well as having everything line up properly. Also, what does the part count of the 8070 have to do with anything? This model does many more things than the 8070 did. If the 8070 had all wheel drive and a complete working steering system along with an actual transmission, how many more parts would it have? Lets take the spoiler of the 8070 for an example, it was basically 2 1/2 panels and looked like crap, crow's looks like it has about 20 and it looks excellent. The jealous haters in this world really and truly astonish me. It's freaking Legos people. Are you Crowkillers' mom or something? I already stated that I KNOW WHAT THE "Lego code" REFERS TO! but what is it? By your definition, almost every MOC complies with the "Lego code" - there are very few that force and bend parts. You are extremely narrow-minded, you know that? Please comment on the MOC and leave your personal attacks for somewhere else. I apologise for my comment. I don't like being called a "hater" for asking a perfectly valid question - about the MOC. >> "You are extremely narrow-minded, you know that?" Regarding the MOC, this is a very nice looking car. The shape, and the beams on the side of the car especially, do somewhat resemble 8070, but it's still a great look, especially in the top down photo. As for technical function though, they seem pretty standard for Supercars, so until I see more of this gearbox I'm going to say it's not quite as innovative as said. I'm glad it's not motorized though, Supercars don't need motors to show functions. Why is it that every model that Paul or Nathanael do cause so much controversy? I mean I could see if they were stealing other people's ideas or designs, but that isn't the case at all. And as far as this model being a clone of the 8070, the only similarities that I see are that it is red and has 4 wheels. This really is a beautifully done model even if the functions are somewhat basic and not motorized. To the people disrespecting, you need to realize that there are probably only a handful of builders in the world that could pull off something as nice and well designed as this. Keep up the amazing work crowkillers! You continue to inspire. Please, Please, Please send an application, your resume, and these photos to TLG so you can design sets for them so we all can share in your glorious talents. This car deserves to be one of the great supercars. I have to admit, this is probably the nicest looking technic car that I have seen. The color scheme is outstanding and the shape is amazing for a pure technic model. Quite impressive work done on this MOC. This model is very very good. The designer has introduced some interesting new ideas. I especially like the front end. I am not into Technic cars as they usually don't look very good and more into heavy equipment but I must say that is a very pretty car and well done too! this is a very nicely designed model. easily one of the finer looking all technic cars built to date that actually has functions. looking forward for instructions in the future. also like the transmission setup. never seen anything like that before. would like to see it actually working though. "Theres something strangely similar about the last few comments"
I can assure you that they are nothing but fanboys. It is the same thing at the crowkillers site in the comments section. Personally, I think this model is very weak to be called a "Supercar" and then throwing "Deluxe" into the Title makes it even more comical. This is an average model at best and the fanboys know it. You people need to realize that this model COULD NEVER be released from TLC and crowkiller COULD NEVER and WILL NEVER work for them. Sorry to be so harsh, but I am sick of seeing how great of a builder that he is when there is no truth to it what so ever. Average at best. Leave the real building to guys like Nico71, Jovel, Sheepo, and Ming Thein. 'Fanboys'? More like 'fanboy'. These were all written by the same person. This is what causes all the controversy on NK and CK MOCs. Yes, there have been several praise comments in a row, but they are not fake. Did you built any of these? Honestly I don't believe, otherwise you won't be commenting like you did. Which is the added value of that? But I something which is obviously wrong : "the part count doesn't come into play when trying to stay within the guidelines of trying to retain the Lego Code"
I must admit you might have some reason with this point. Nevertheless we still don't know the part count for this car from Paul. It uses to be high though. This car probably has somewhere around 1,600 parts. Paul, don't continue to feed Anio the troll. The guy is nothing but a world wide trouble maker. You have gone far enough out of your way to prove your point and don't need to do so any further. Anio builds Star Wars ships and vehicles and then creates his own "Ultimate Collector Series" cards for them like they are some sort of official model, so him trying to correct you on what is ***Lego Code*** is a joke. He is also probably the guy who is leaving those nasty comments on your blog at your site which by the way, you really need to delete if possible. I wonder who is the troll. Aren't the recent measures enough? Should I turn on comments moderation!? All cars and builders mentioned where fantastic. Now that matters, the CK car, first i want to say that the technic panel use is so much fantastic, that is not easy at all, the front made with technic links is also innovative and the entire shape of the car where amazing and realistic. I HAVE NOT HAD ANYTHING TO SEE WITH THESE COMMENTS!!! Both cars have different built concepts, you can not compare them! !